Thank you for your post. 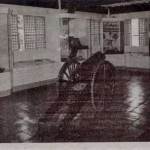 Our group of students & parents is thinking of organizing a field trip to Aguinaldo Shrine. Would you know if we need to make prior arrangements with Mr. Alcid to give us a guided tour of the shrine, or can we just drop by anytime? Thank you again!